Start off your visit on the 4th (Tue): take in the architecture and atmosphere at Barcelona Cathedral, then wander the streets of El Barri Gòtic, then pause for some photo ops at Casa Batllo, and finally appreciate the history behind Casa Mila - La Pedrera. Get ready for a full day of sightseeing on the 5th (Wed): enjoy the sand and surf at Barceloneta Beach, then make a trip to Basilica of the Sagrada Familia, and then walk around Parc Guell. For reviews, maps, traveler tips, and other tourist information, read Barcelona trip planner . Perth, Australia to Barcelona is an approximately 23-hour flight. The time zone difference when traveling from Perth to Barcelona is minus 7 hours. Traveling from Perth in June, things will get a bit warmer in Barcelona: highs are around 30°C and lows about 22°C. Finish your sightseeing early on the 5th (Wed) so you can drive to Sarlat-la-Caneda. On the 6th (Thu), paddle through the water with a kayaking and canoeing tour, then admire the natural beauty at Les Jardins de Marqueyssac, and then don't miss a visit to Vieux Sarlat. Get ready for a full day of sightseeing on the 7th (Fri): Head underground at Le Gouffre de Proumeyssac, explore the historical opulence of Chateau de Beynac, and then explore the historical opulence of Chateau de Castelnaud. To see ratings, maps, and more tourist information, use the Sarlat-la-Caneda road trip planning website . You can drive from Barcelona to Sarlat-la-Caneda in 6 hours. Alternatively, you can take a train; or do a combination of flight and train. Traveling from Barcelona in June, you can expect nighttime temperatures to be a bit cooler in Sarlat-la-Caneda, with lows of 15°C. Cap off your sightseeing on the 7th (Fri) early enough to travel to La Croix-Valmer. La Croix-Valmer is a commune in the Var department in the Provence-Alpes-Côte d'Azur region in southeastern France.Geographythumb La Croix-Valmer is at the foot of the Massif des Maures hills in the Bay of Cavalaire-sur-Mer, halfway between Le Lavandou and Saint-Tropez.HistoryThe Emperor Constantine the Great, on the way to wage war against his brother-in-law Maxentius in 312 AD, is said to have had a vision of a cross in the sky stating "in hoc signo vinces" (by this sign you will conquer) at the location where La Croix-Valmer is now situated. Visit Plage de Sylvabelle and Plage d'Heraclee for some beach relaxation. Escape the urban bustle at Plage de Gigaro and Plage de Vergeron. Get out of town with these interesting La Croix-Valmer side-trips: Le Lavandou (Plage d'Aiguebelle & Plage de Jean Blanc). The adventure continues: tour the pleasant surroundings at Plage du Debarquement, hike along Sentier Botanique, and enjoy the sand and surf at Plage des Marines. For more things to do, ratings, and more tourist information, you can read our La Croix-Valmer holiday maker site . Traveling by car from Sarlat-la-Caneda to La Croix-Valmer takes 7.5 hours. Alternatively, you can fly. In June, daily temperatures in La Croix-Valmer can reach 34°C, while at night they dip to 17°C. Finish your sightseeing early on the 10th (Mon) so you can drive to Nice. Start off your visit on the 11th (Tue): kick back and relax at Plage Le Sporting and then enjoy the sand and surf at Promenade du Soleil. Get ready for a full day of sightseeing on the 12th (Wed): enjoy the sand and surf at Coco Beach, then wander the streets of Vieille Ville, and then kick back and relax at Castel Plage. Ask Inspirock to suggest an itinerary and make planning a trip to Nice fast, fun, and easy. Getting from La Croix-Valmer to Nice by car takes about 2 hours. 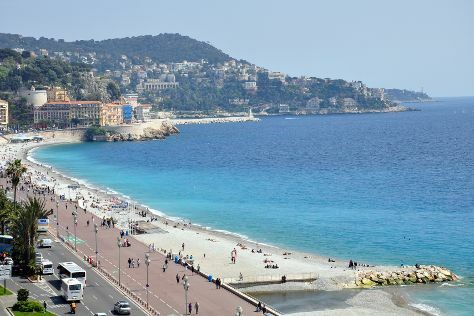 Traveling from La Croix-Valmer in June, you will find days in Nice are slightly colder (28°C), and nights are somewhat warmer (22°C). Wrap up your sightseeing on the 12th (Wed) early enough to travel to Bonifacio. At the southernmost tip of the island of Corsica, Bonifacio is a city with chalk-white limestone outcrops sculpted into unusual shapes by the ocean. Take a break from the city and head to Plage de San Giovanni and Plage de Stagnolu. Relax by the water at Plage du Petit Sperone and Sentier Littoral des Bruzzi. And it doesn't end there: don't miss a visit to Bonifacio Citadel, Head underground at Grottes de Bonifacio, explore the different monuments and memorials at Cimetiere Marin de Bonifacio, and zoom along the surf with a waterskiing or jet-skiing adventure. To find photos, other places to visit, maps, and more tourist information, refer to the Bonifacio trip itinerary maker website . Traveling by flight from Nice to Bonifacio takes 3 hours. Alternatively, you can do a combination of ferry and car; or do a combination of ferry and bus. While traveling from Nice, expect a bit warmer days and little chillier nights in Bonifacio, ranging from highs of 32°C to lows of 17°C. Finish your sightseeing early on the 15th (Sat) so you can drive to Calvi. Calvi is a commune in the Haute-Corse department of France on the island of Corsica.It is the seat of the Canton of Calvi, which contains Calvi and one other commune, Lumio. Visit Plage de Ghignu and Arinella and Algaio Beach for some beach relaxation. Get in touch with nature at Aregno Beach and Scuba & Snorkeling. Take a break from Calvi with a short trip to Plage de l'Ostriconi in Palasca, about 50 minutes away. 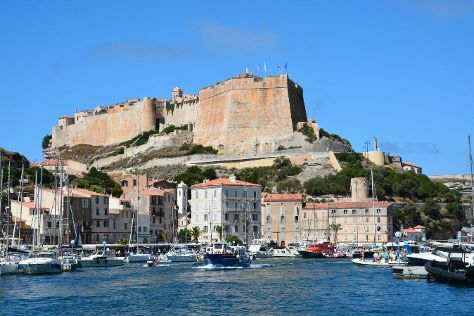 And it doesn't end there: contemplate the long history of Citadelle de Calvi, don't miss a visit to Chapelle de Notre Dame de la Serra, enjoy the sand and surf at Punta Spano, and get some thrills on the water with a speed boat tour. To find maps, traveler tips, where to stay, and tourist information, read our Calvi trip itinerary website . Traveling by car from Bonifacio to Calvi takes 4 hours. Alternatively, you can take a bus; or do a combination of bus and train. In June, plan for daily highs up to 31°C, and evening lows to 20°C. Wrap up your sightseeing on the 19th (Wed) early enough to travel back home.